Twomey Cellars Pinot Noirs and Merlot are priced at $50 and the Sauvignon Blanc at $25. The annual production at Twomey Cellars is 12,000 cases for all wines. The two tasting rooms, Twomey Calistoga and Twomey Healdsburg, are open daily. The wines are well distributed through finer retailers. Visit the website at www.twomeycellars.com for more information. Twomey Cellars tasting room is open Monday through Saturday from 9-4. It is located two miles south of Calistoga at the intersection of Highway 29 and Dunaweal Lane (1183 Dunaweal Lane). Tastings, including a Twomey tasting glass, are $5. The phone is 800-505-4850. 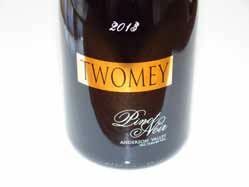 The Twomey Pinot Noir may be purchased on the website, through the tasting room, as well as through retail distribution (stores that stock Silver Oak).